Following on from our recent podcast about common mistakes in English, I thought you might be interested in looking at some real life examples of mistakes that learners of English have made. Below are 10 genuine mistakes found on the website engrish.com. In fact, the mistakes presented here are so bad that they are all examples of what we call “Broken English” i.e. English which is so terrible that the intended meaning of the sentence has been lost. 1) What was the original intent of the sign? What was it supposed to say? 2) What impression does this mistake make on a native speaker? Answers can be found at the bottom! 1. 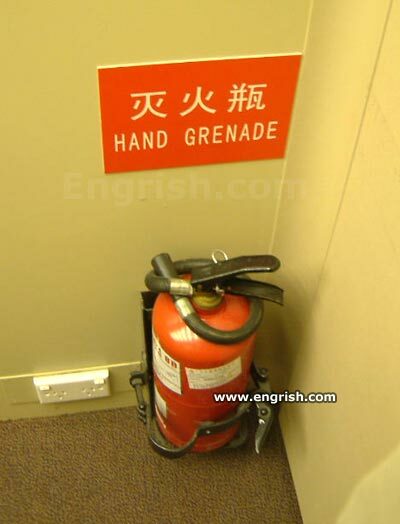 Should say “Fire extinguisher”. A “Hand grenade” is a small explosive device, the use of which would probably start more fires than it put out! 2. 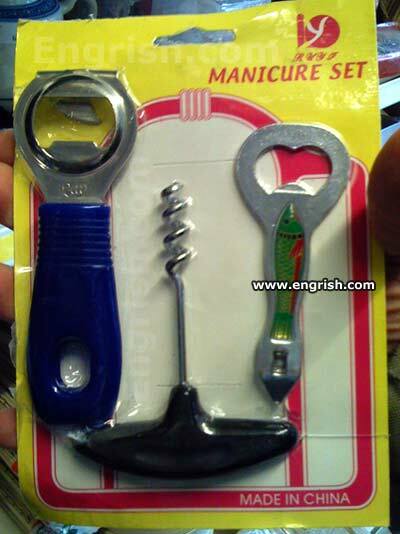 Should say “Bottle opening set”. A manicure is something you do to your nails to make them look pretty. It would be very painful to get the two confused! 3. 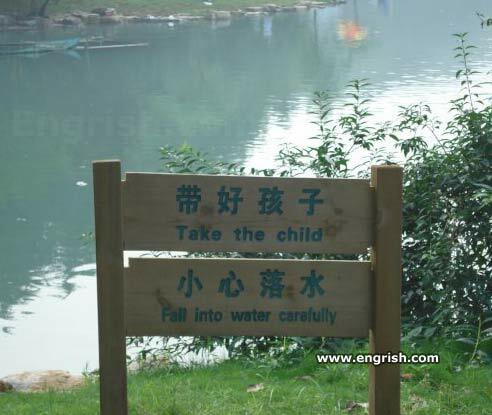 Should say “Take children by the hand when walking near the water.” The way the sign is written right now, it sounds as though it wants you to murder children by throwing them (gently) into the water! 4. 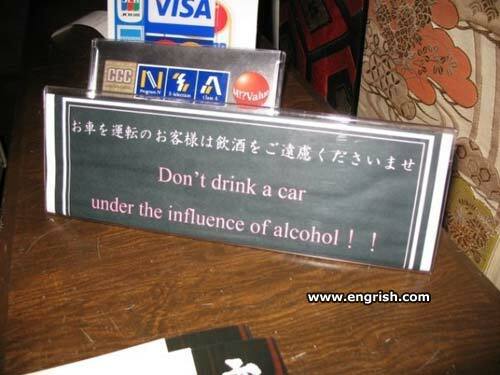 Drinking a car would be impossible! Eating it would be easier but still very difficult. Better would be to say, “Don’t drink and drive”, making the whole thing much clearer to everyone. 5. 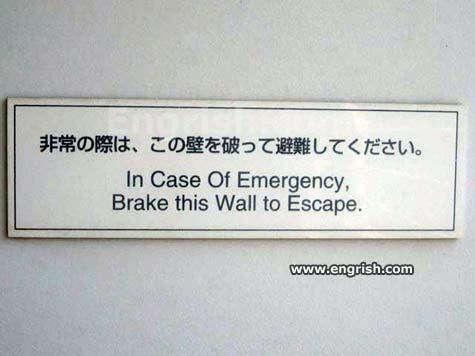 At the very least, this sign should say “break” not “brake” but as for the rest, I honestly have no idea what it’s trying to say. Is the sign really asking you to break a wall? Is that even possible? 6. 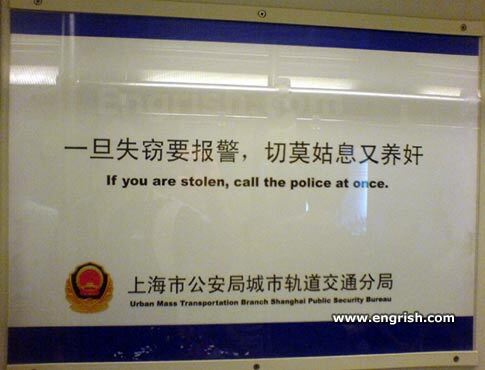 Say, “If you are robbed…” Saying “stolen” here makes it sound like you, yourself, have been kidnapped. 7. 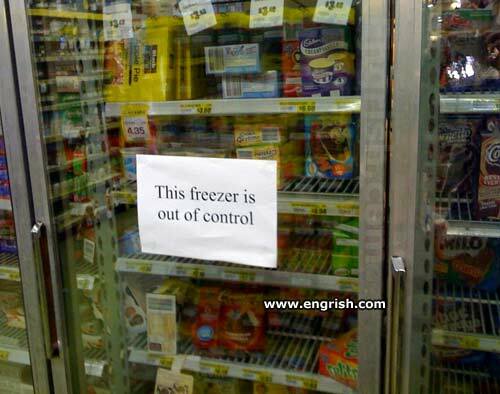 “This freezer is out of order.” Out of control suggests that it is running free causing chaos and no one can stop it. Obviously, this isn’t true. 8. “You’d better” sounds like a very passive aggressive threat. The intended sentence is probably a warning that the restaurant’s peak time will end in 2 hours and that service will improve at this time, leading to a more enjoyable meal. It would be better to say, “A gentle reminder. 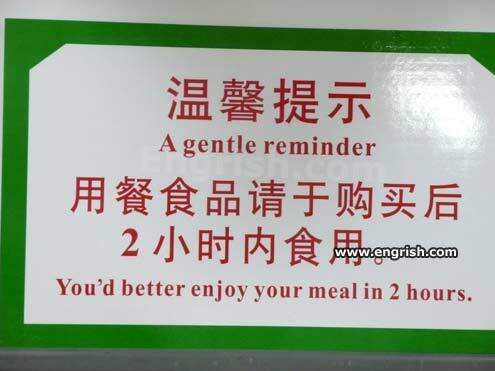 You will have a more enjoyable meal in 2 hours”. 9. Should say “Beware of trip hazards and sudden falls”. By simply saying “missing foot”, it suggests that there is literally a foot missing. 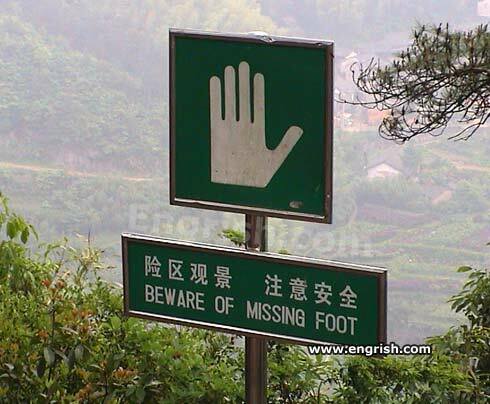 The sign then tells us to “beware” of this foot, which, coupled with a picture of a hand leads to some very strange mental imagery of a killer foot on the loose! 10. 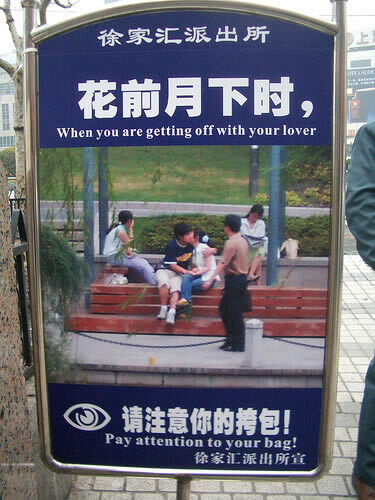 Generally, the English here is very good but it’s the phrasal verb “get off” which causes the problem as to “get off” with someone means to kiss them passionately. (The fact that two people in the picture are kissing just adds to the humour here). Better would be to say “disembarking” to avoid any confusion in the matter. So, the next time you’re thinking “it doesn’t matter if I make a few mistakes; native speakers will still understand me!” think about these signs and know that it isn’t always true!